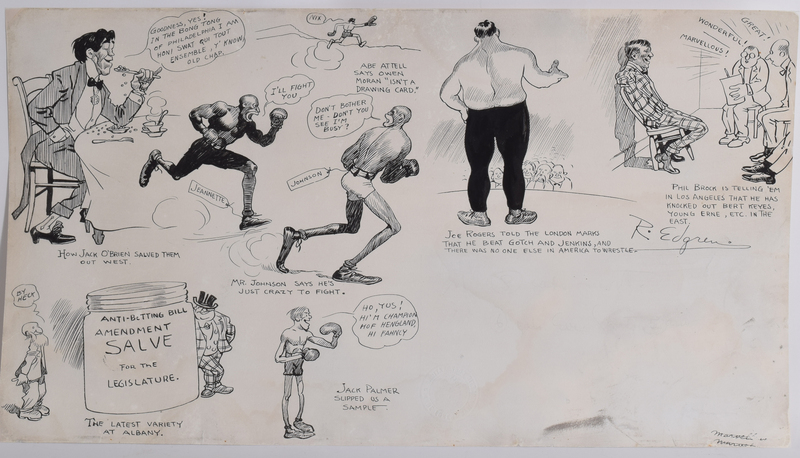 Roger Edgren Illustration showing Boxers including Jack Johnson in different situations.In good condition , great piece. Robert Wadsworth Edgren (January 7, 1874 – September 9, 1939) was a nationally syndicated American political and sports cartoonist, reporter, editor and Olympic athlete.He began his journalism career in 1895 at the original Hearst newspaper, The San Francisco Examiner. He was given the "inconsequential" job of a "handy man" with the Examiner but his work on the build-up to the historic 1897 world heavyweight championship between Bob Fitzsimmons and "Gentleman Jim" Corbett launched his career.He was transferred to the Hearst paper in New York, The Evening Journal, where he was appointed political cartoonist. He was dispatched to Cuba to cover the Spanish–American War in 1898. Reporting from the scenes of intense fighting, Edgren became famous for his "Sketches from Death," images of war atrocities that shocked readers of Hearst papers across America. When William Randolph Hearst himself told Edgren, "Don't exaggerate so much," an angered Edgren produced 500 photographs to prove the accuracy of his drawings. The images were eventually displayed before the United States Congress, causing a sensation Edgren was captured by the Spanish, who intended to try him in a military court, but the young reporter escaped and, disguised as a tugboat engineer, made his way to safety at Key West, Florida.